In the past, I have written of rei-king and sie-thing as two of the many healthful exercises offered here at Springtown Farmden Health Spa. We now have a new offering at the spa: garden yoga or, more catchy, gardoga or yōgdening. I like the last one best. Yōgdening grew out of my respect for the soil, my desire to maintain and foster a healthy balance of life below ground. A healthy population of bacteria, fungi, worms, actinomycetes and other below-ground dwellers translates to healthy plants above ground. Those beneficial creatures need to breathe, which is why most gardeners and farmers till their soil. To aerate it. But tilling a soil also burns up valuable organic matter. This organic matter feeds soil organisms and, in turn, plants, makes nutrients already in the ground more accessible to plants, helps hold moisture for plants, and helps aerate the soil. Getting back to yōgdening . . . Weeds are making inroads into certain parts of my gardens. Not my vegetable gardens, the 3-foot-wide plant beds of which I keep well weeded with my feet firmly planted in the 18-inch-wide paths bordering the beds. But the only way I can reach into some other planted areas, a bed of various flowers sprawling beneath some Asian pear espaliers, for example, is by stepping into them. To minimize foot traffic, after stepping into a planted area, I try to keep my foot anchored in place, from which I pull every weed I can reach. As you might imagine, reaching every weed possible with feet planted in one place calls for all sorts of contortions and stretches forwards, backwards, and sideways involving my legs, trunk, shoulders, arms, and neck. My guess is that after a half-hour of weeding, I’ve run through a close approximation of Utthia Trikonāsana (Triangle Pose), Vīrabhadrāsana (Warrior Pose), and Uttānāsana (Standing Forward Fold Pose), to name a few classic yoga poses — and cleared away weeds! Weeding (or, perhaps, I should write “we-ding,” another spa offering) is especially satisfying this time of year. Dry weather has slowed sprouting of new weeds so cleared areas remain clear. Dry weather is also good for fruit ripening. That is, ripening rather than rotting. As sweetness develops in ripening fruits, they become more susceptible to rotting. Fungi, like humans, can make quicker use of simple sugars than more complex carbohydrates, such as a are found in unripe fruits. Fruits with thin skins are especially susceptible to attack from fungi. For a variety of reasons, known and unknown, this has been a good year for plums. In past years, late frosts in spring have snuffed out blossoms or plum curculio has caused many, if not all, plumlets to rain to the ground. This year, blossom buds were unscathed from winter cold or spring frosts, curculios were kept at bay by my spraying Surround, a commercial product that is nothing more than kaolin clay. 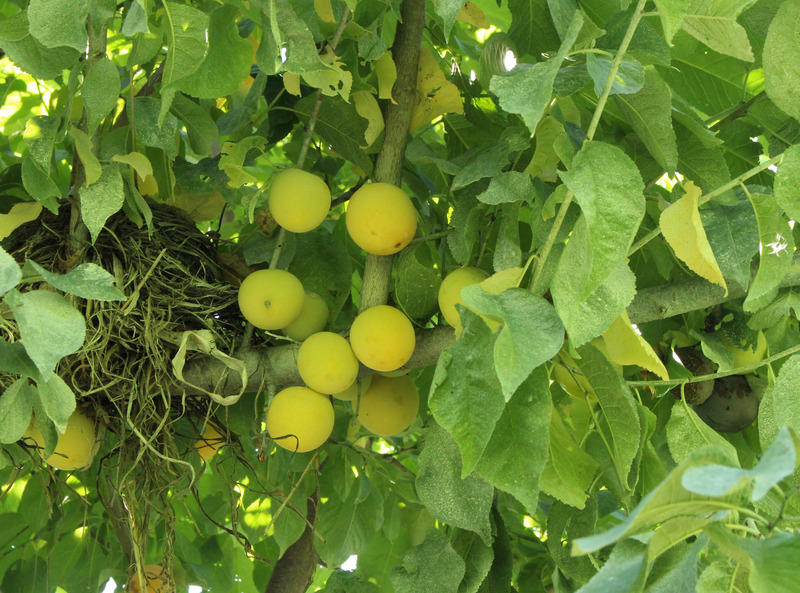 Current dry weather should also limit plums’ other nemesis: brown rot, a fungal disease that turns ripening fruit gray and fuzzy and then, at the end of the season, into dark brown, shriveled mummies. (Of course, beautiful clear days are often followed by clear nights during which water, in the form of dew, condenses on fruits and leaves.) The mummies hang from the branches, along with cankers on branches, spread spores and infection the following year. Fallen mummies are also a source of the following season’s infection. Brown rot gets to work early in the season, around blossom time, and then later in the season, as fruits are ripening, which is now, for my Shiro plums. Early in the season, I added sulfur, a naturally mined mineral whose use as a fungicide goes back to the ancient Greeks, to the mix when I was spraying Surround. Supplementing that spraying was cleaning up hanging and fallen mummies at the end of the season, and promoting drying of branches and fruits with pruning and thinning out of excess fruits. The upshot is that some brown rot is showing up on ripening plums. But not all of them. And those that have been spared are delectable. Even the birds think so. Their peckings, unfortunately, like wounds inflicted by plum curculios, increase fruits’ susceptibility to brown rot. 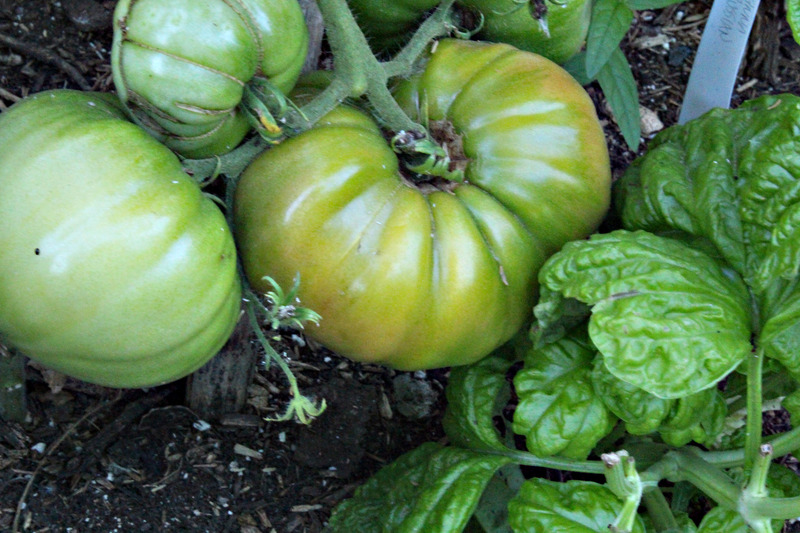 Tomatoes are growing like gangbusters, here and in other gardens I’ve seen locally. And the fruits are likewise growing very plump. But the scene is not as rosy as it should be, literally, because too many of the tomatoes are still green. Again, other local gardens mimic my experience. How are your tomatoes doing this year? Day after day of bright sunny, weather and moderate temperatures should have promoted ripening. Then again, day after day of rainy weather last month might have retarded it. At any rate, in gardening and farming, you can’t go wrong blaming the weather. This entry was posted in Fruit, Gardening, Pests, Vegetables and tagged brown rot, plums, ripening, tomato, yoga. Bookmark the permalink. Trackbacks are closed, but you can post a comment. As I tell my students, we learn by making mistakes. Mistakes are good. I’ve learned a lot this gardening season. Due to hot sunny days and virtually no rain, I’ve had a banner year for tomatoes. It’s the first time in years I’ve had enough tomatoes for sauce, albeit in limited quantities due to the small size of my tomato patch. I had Sungold tomatoes in June and Celebrity tomatoes before the Fourth of July. Now the big Rutgers tomatoes are coming in. But–I have animal predation. The poodle is permitted to snack on low-lying fruit, especially the Sungold tomatoes. But something more agile–possibly a raccoon–is taking bites out of fruit high on the vines. The poodle does his best to patrol at night, but the critter is canny. Peas and green beans are largely a total fail; next year I will order innoculant before the seed houses run out. Herbs are great. Only three cucumber plants thrived, but I have more cucumbers than I know what to do with. I give them as gifts. Now here’s the mistake: At the way back of the garden, I planted six butternut squash seeds on a five-foot trellis. Obviously I’d never grown them before. The plants quickly outgrew the trellis and headed for parts unknown. One is covering the compost container. Two others headed for the house and have nearly reached the deck, although one is branching onto the lawn. They have covered my neatly mulched paths, making it difficult to pick. One is invading the fig. Next year I will use much bigger trellises. There are butternut squash growing everywhere. All the gardeners in town are tired of this drought. The town seems to have come into particular disfavor: every time we are promised thunderstorms, they leave rain elsewhere. I am running around with a single soaker hose and an oscillating sprinkler, and calculating rainfall has become a part-time job. I know: I should have put in drip irrigation! You took the words out of my mouth: Get drip irrigation. I also suggest, in the future with those beds, doing nothing more than each year laying an inch or more of ripe compost on top of each (as spelled out in my book WEEDLESS GARDENING). I had my first small crop of Shiro plums this year and was not too impressed with the flavor (or rather lack thereof). I will give them a coupe of more seasons to prove themselves before topping. But was wondering do you like them? I think Shiro plums are quite good. 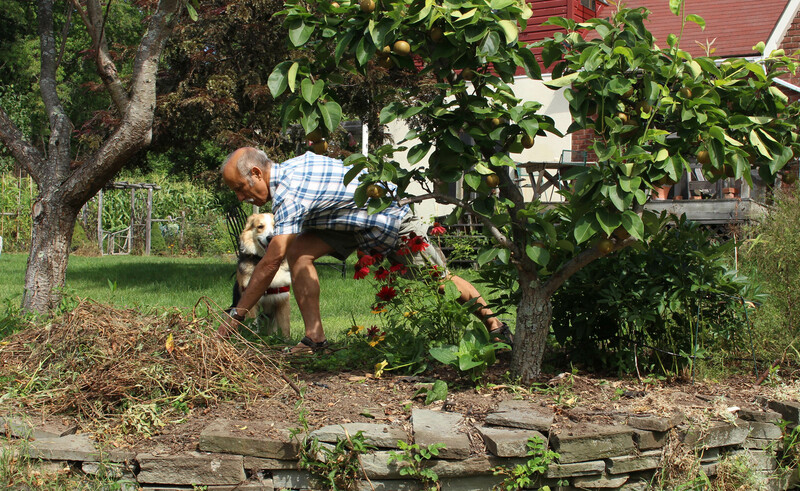 Not the best, but worth growing for their reliability — for a plum in the northeast. I feel the same with a garden “workout”: stretching, bending, twisting. And when there’s construction to be done: lifting, pushing, pulling, like balancing a heavy load in a wheelbarrow while maneuvering over rough ground. And all this is done in the fresh air and sunshine. Sure its hard work but not a chore and cheaper than a gym. Thanks for the interesting article Lee.